For that professional advantage, look no further. Leading the way in professional serviced offices in Geelong and the surrounding region, PACE Business Services gives you access to the facilities and resources your business needs to grow and succeed. With public transport close by, and an easy commute from Melbourne, we have executive serviced offices and work spaces in a secure, modern, professional building in the heart of Geelong. With PACE you immediately have the facilities and current technology your business needs to thrive - and all at a fixed monthly price with no additional cleaning, maintenance and other unexpected “overhead” surprises. Our professional reception and administrative team will warmly welcome your clients and make sure they get the best impression of your business, first time and every time. And if you need the assistance of experienced and capable support staff, they’re here and ready to help you at a moment’s notice. So whether you have outgrown working from home, are wanting to establish a corporate presence in Geelong, or simply need short or long term accommodation for your team or additional staff, PACE Business Services has the perfect solution for you with our serviced offices in Geelong. Connection into the professional hub of the Geelong business community. 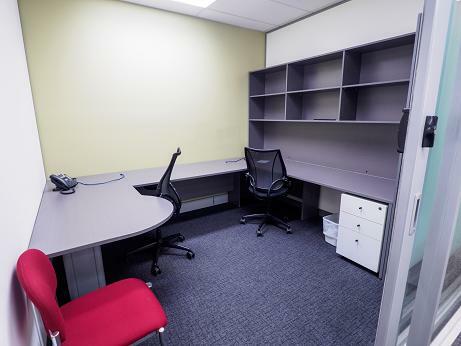 Fully furnished executive offices and work spaces including executive chairs, lockable file drawers and storage, dedicated internal phone extension. Outgoings included: Rates, gas, electricity, internet, building insurance, cleaning, security, waste collection, gardening, building maintenance. PACE provides the perfect environment for you to work smarter and progress your business in a supported community with other business professionals. If you’re expanding into the region, or perhaps providing a satellite office for staff commuting 2-3 hours each day, PACE Serviced Offices is a low risk simple solution that's ready now for you. Complete with dedicated and experienced staff, equipment and facilities, business has never been made easier. Forget about overheads and costly service providers. Simply setup, plug in and focus on doing business.